I’m still detoxing after the excesses of December, but this dish needed to get made! I just got assigned an additional role at work and to add to that, we have a new boss. Changes, changes, changes – how I hate them! (Especially, when I’m not the one making them!) Since I’d sworn off alcohol atleast for a month (part of the detox plan), I needed to find an alternative. (And No, I can’t make the ‘special’ brownies). 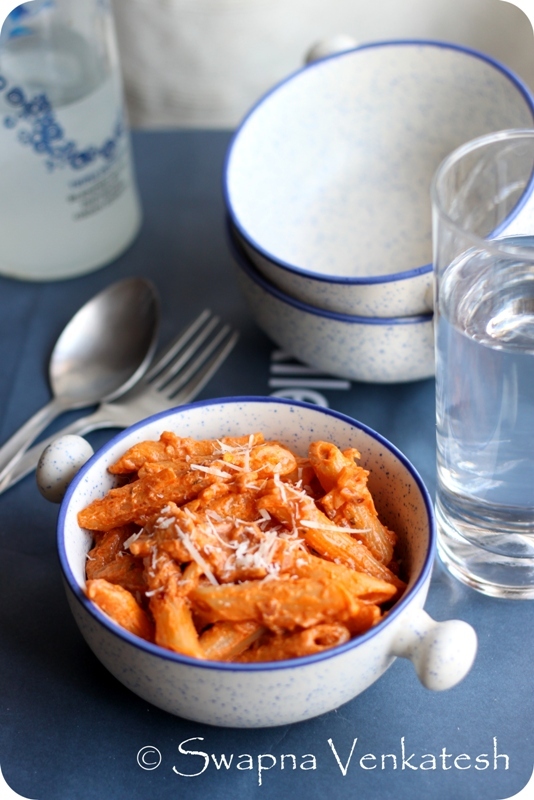 So I gave myself and my frazzled nerves some loving, in the form of Penne a la Vodka. It doesn’t count as cheating because technically, the alcohol content is supposed to burn off when you deglaze the pan with it. (It’s another story that when you’re off alcohol, even a whiff of it can send you into a happy place). Anyway, this is a classic recipe and loved the world over. It’s sophisticated enough to serve at a dinner party and comforting enough to take it to the couch with you. When you have the best of both worlds you don’t really question it…..ever! Heat the olive oil in a large saucepan over medium-high heat until very hot but not smoking. Add Bacon and cook, stirring occasionally, until crisp, about 4-5 minutes. Remove with a slotted spoon and set aside. Reduce heat to medium. Add the onions and cook until softened and golden brown, Add in minced garlic. Saute for about 2 minutes. Toss in Chili flakes and sauté. Stir in the vodka (deglaze the pan) and increase heat back to medium-high. Let it simmer for 2 mins. Add the tomato puree, ketchup, sugar, and salt into the onion mixture. Briskly simmer for 8 – 10 minutes, stirring frequently, until the alcohol flavor has cooked off. Reduce heat to low and whisk in heavy cream. Finally add in the parmesan and stir. Meanwhile, bring a large stockpot of heavily salted water to a boil. Add pasta and cook, stirring occasionally, until al dente or according to package directions. Reserve ¼ cup cooking water before draining. 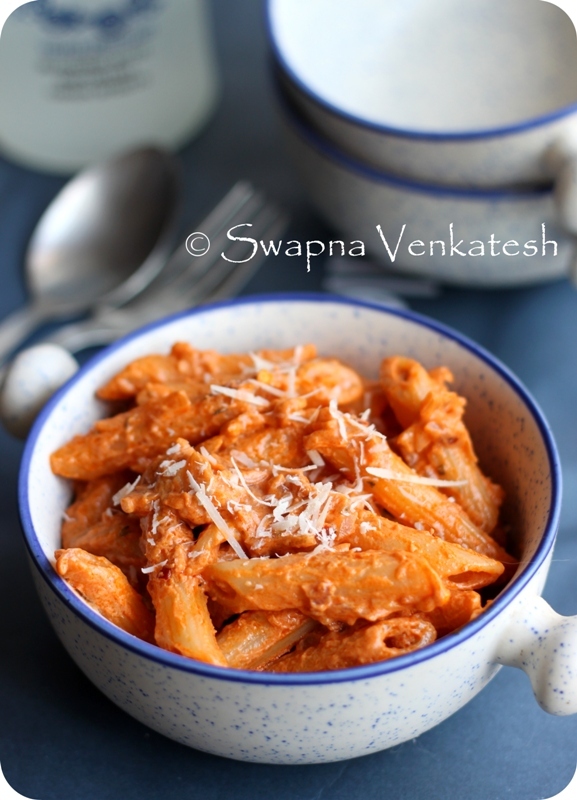 Gently fold the cooked penne and reserved bacon into the vodka sauce and continue cooking on low heat for another minute. Toss with a bit of pasta water if sauce is too thick. Season with additional salt and Chili flakes if desired, and serve with fresh Parmesan and chopped Basil. Drooling! This looks amazing. Great photos! This looks and sounds absolutely delicious. 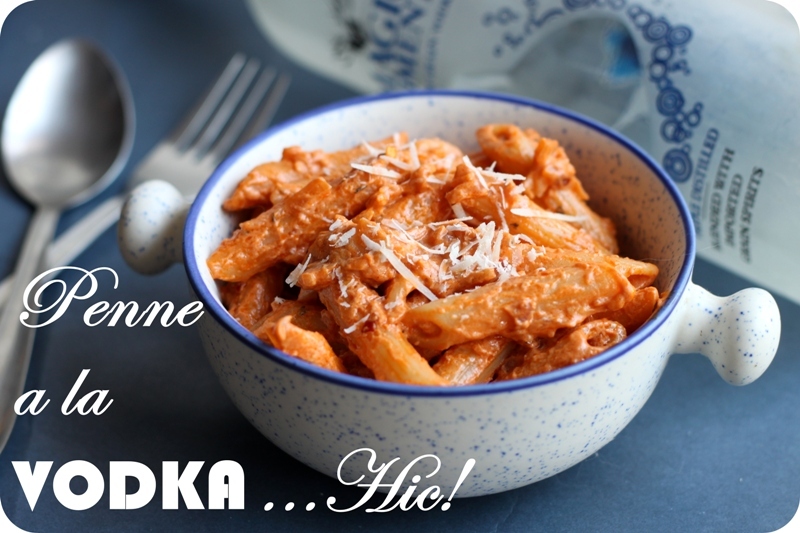 I've never tried cooking with vodka before, but definitely think I'm going to have to give it a go!